A special day, to tell the three years of Life Primes, meet for a greeting, thank those who believed, and start again with the awareness of having helped to disseminate new knowledge and strategies of adaptation, in front of the challenges posed by Climate change. 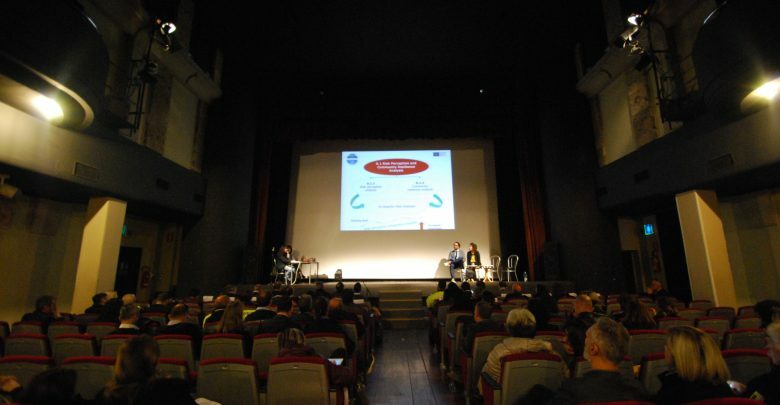 Friday, November 16, at the Teatro Laura Betti of Casalecchio di Reno (Bo), administrators, technicians and citizens met at the end of the project, to present the beautiful experiences made in the 10 involved communities, and to understand how, from the results obtained, is Possible to put in circulation, in daily life, good practices of prevention and protection from the risks. The initial greeting of the mayor of Casalecchio, Massimo Bosso , alternated on stage Clarissa Dondi , the regional Agency for Territorial security and civil protection of the Emilia-Romagna region, lead partner of the project and Marco Cardinaletti of Eurocube, the company that supported the project partner regions. The course participated in 13 public meetings, 3,000 citizens involved, 2400 CAAP (local adaptation civic plans) compiled. Were produced five video tutorials, with an all female protagonist, Ada, which accompanies and explains in pills what are floods and storms , climate change , adaptation Actions , What to do in case of Alert and the Municipal civil protection plan . Among the most relevant tools, Primes has developed an interregional handbook for the homogenization of the alerting systems, and the on-line platform. The event continued with a preview of the < a href = "https://www.youtube.com/watch? v =-4k5ti3hkqs & feature = Youtu. be " > final Video which retraces in three minutes the history of the project with the most significant images of the tests of training, the public moments of confrontation, the meetings in the schools. It was then the turn of Eva Merloni Area Europe that has entered into the merits of CAAP, with an in-depth analysis of the results of online compilation: the level of knowledge of risk and resilience has been on average in the three regions Involved more than 70%; A positive fact, which has nevertheless highlighted the need to continue working with citizens by developing new adaptation actions; What is also highlighted by the work of the team of the Polytechnic University of Marche, represented by Maria Teresa Carone . In this case a study was conducted, based on scientific research methods, on the degree of resilience of the ten experimental areas, structured in two distinct moments, before and after the interventions of Primes. The final investigations found that, in the majority of cases, the experimental communities were classified within the so-called “resilience area”, improving the starting position. Greater awareness of the level of risk and a more widespread sensitivity on its reduction-and the ability to respond-is paid for more incisive and frequent actions of information and training, preferably through public Meetings. The first part of the event was closed by the section “Tales from the territories involved”, in which space and voice were given to the communities concerned. Marco Bacchini of the Romagna Area service of the regional Civil Protection Agency, has exhibited the most salient actions that have characterized the experimentation carried out in the six localities in the province of Bologna, Ravenna and Ferrara. Very interesting aspects have emerged such as the easy replicability, the reduced costs of participation initiatives open to the community; and the positive effects on communal emergency planning, especially as regards information to the citizen. A positive budget, which has led administrations, civil protection volunteers, schools and families to work together. The mayor of Pineto (TE), Robert Verrocchio , told his personal experience Primes. Meet the communities, talk about risks, explain the responsibilities of government, and foster participation, helped the administration to rethink the communal plan in the light of the national protagonist, aware of both the fragility of the territory in which He lives both of his own extraordinary ability to strive to defend the territory. Silvia Rossi , representing the civil protection of the Marche region, has entrusted itself to the metaphor of bees and the hive to tell its wonderful experience of dissemination, especially in schools. A continuous work, passionate, with the pupils of the primary, first and second degree, which also involved teachers, families and school staff. Starting from the fears and memories of the most recent floods-for example Senigallia 2014-It has been sought, to reconstruct a correct perception of the risk and self-protection of individuals, through work in the classroom and with targeted exercises and tests of Evacuation. Also in the Marche, the municipalities involved in Primes, are adapting their communal plans according to the results obtained by the project actions. To reward the most resilient communities, another highlight of the event, was Paola Gazzolo , Councillor for civil protection and environmental policies of the Emilia-Romagna region. The results of the trial-he said-went even further than the initial expectations. A project is also effective from the skills it puts in the field to continue its work and move forward. On the stage of the Teatro Laura Betti have risen in succession, Andrea Emiliani , mayor of Sant’Agata Sul Santerno (RA), the councillor of the municipality of Ravenna Gianandrea Baroncini, Daniele Garuti , mayor of Poggio Renatico (FE), Nino di Fonso , mayor of Torino di Sangro (CH)-to whom will be delivered a multimedia totem custom Life primes-and the councillor Valerio Pignotti, representing the municipality of San Benedetto del Tronto (an) who receives as a gift a Traffic light panel. When in the room the lights were extinguished, on stage it was staged “ La Margherita di Adele 2.0 “, a story written by Marco Vignudelli and interpreted by the actors Anna Pancaldi , Fernando Vozzi and Marco Soccol , Stefano Antonini , directed by Stefano Antonini . The show, already represented in other contexts, aims to explain what climate change is, as it is manifesting, how temperatures are changing and tell the data about heat waves, drought, intense weather events, through a History set in 2050, in a recognizable place, which is changing and where there are problems that touch our lives and our communities closely. In the stalls have taken place many citizens. The event was concluded by a debate, conducted by Alessandra De Savino , of Eurocube, with experts Carlo Cacciamani , head of the central Functional Center of the Department of National Civil Protection, Sergio Castellari , a climate expert physicist at the European Environment Agency, Costantino Marmo professor of semiotics and history of semiotics at the University of Bologna, Antonello Pasini , physicist Climatologist of the CNR and author of many specialist publications. We have discussed the changing climate, the impact on the risk conditions, the concrete and feasible actions to reduce it, the important role of communication, and how important it is to explain it to citizens with appropriate language. Experts also faced on adapting to climate change, and on economic and social consequences, by tapping on issues of great relevance such as climate migrants. And for a grand finale, the aperitif and the wish of all to see each other soon.